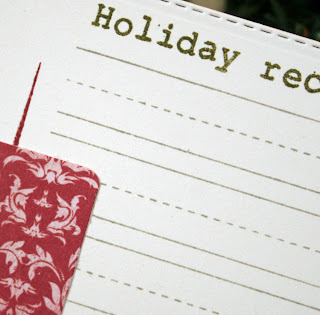 Liz's Paper Loft: 5 Days of Christmas ~ Day 5! 5 Days of Christmas ~ Day 5! Hello & welcome to My Creative Time's "5" Days of Christmas"! This week we will be sharing w/you LOTS of last minute Christmas ideas, such as cards, layouts, home decor, 3-D items & what ever else come to mind that will help YOU get your juices flowing for the holiday! There will be a giveaway each day & a winner will be announced each day! Example, winner of Monday will be announced on Tuesday, winner of Tuesday will be announced on Wednesday.....and so on! You will see the different prizes each day on Emma's blog HERE! I hope we ALL inspire you this week! I didn't have time to write out the recipe before I took the picture, I really wanted to take my time since I don't have the best handwriting :) However I feel it really important to hand write them, it's like your giving more of yourself that way. I plan on adding a picture of the candy on the red mat, that way who gets this will know what they are making. Wouldn't this be a great gift with a box of family favorite recipes! Handwritten and a picture of past holidays! Be sure to head over to My Creative Time to see what my DT sisters created today's prize package! Also there is still time to enter for My Creative Time's 2014 Design Team Call!!!! What a super cute idea! These could get passed on for generations. Thank you for the great idea for leaving a spot for the picture of the recipe on the card! I too think this is a super cute idea! Gosh you are so right about the handwriting keeping it personal and a treasure keepsake. I love the ways you used Miss Emma's goodies. You are truly always so clever and creative and thanks for all you do and for sharing. What a great gift idea-I would love to see your recipe! What a great idea, Liz! I love the mat for the picture too! Great idea. I plan on making my daughter a recipe book with pics of all the different food. I've been taking pics of my cooking for a while now...all saved in a folder. I think the handwriting makes it more special too. Loved your projects all week! This will be a wonderful addition to your English toffee gift. Love your recipe card idea! I agree handwriting the cards are the best! That is a fantastic idea. The recipe card is really cute and having the recipe be handwritten is definitely very meaningful. So fun and creative!! Love the idea of sharing a recipe card along with a yummy treat! I agree..handwriting the card is important and will make it more cherishable! Great idea to include the recipe and a photo of the candy. What a great idea!!! ;) Your recipients will love it! That's a cute gift idea:) and a great personal touch writing it by hand. 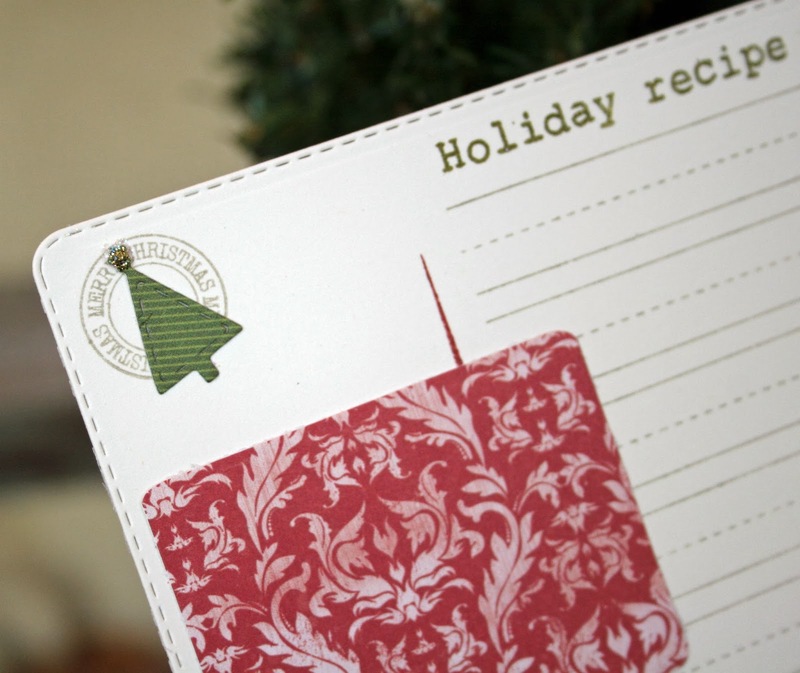 Recipe card - excellent idea, and with a recipe that's a favourite, definitely a 'keeper." Candy for the eyes; candy for the taste buds! LOVE this! Great idea! I make Almond Mocha (I think they are cousins to your recipe) . The recipe is on a recipe card in my Aunts hand writing and I don't know what I treasure more the recipe or recipe card. My Aunt is no longer with us as are many of the kind friends relatives who took the time to hand write their recipes for me. To me it's as special as finding a hand written from that person but maybe with a few butter or chocolate stains lol. Thank you for all your wonderful projects and hard work for this week. Have a safe and happy holiday season. Awesome idea to attach the recipe to your treat! I remember you posting it last year.....Bet it is a HUGE it! Thanks for sharing Liz and have a GREAT weekend!! Making recipe cards would be an awesome gift for my sister! Thanks for this cute idea. 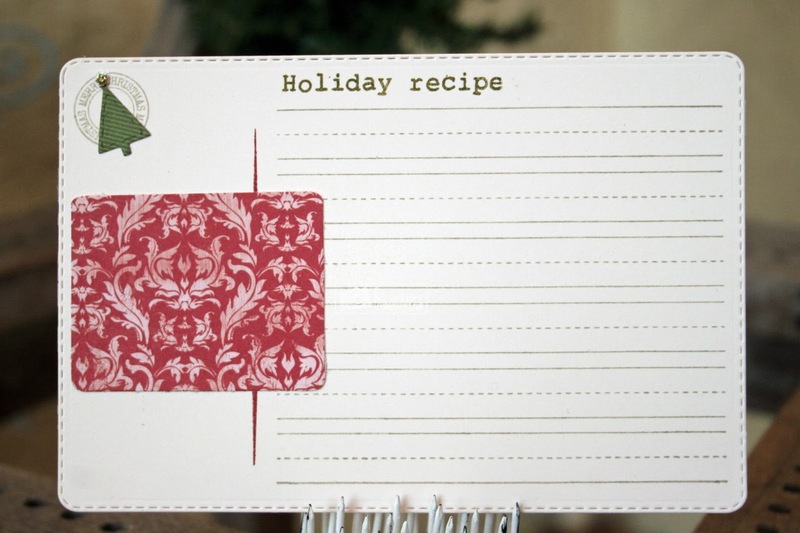 Great minds think alike, as I am making recipe cards too :) I have to say though, I like yours so much better!!! What a great idea to dress up recipe cards with the All Around Holidays stamp set. I love your idea and I can't think of anyone who wouldn't love this handwritten recipe from you! Thanks for a wonderful week of inspiration. How clever!. Very pretty recipe card. I love the idea of making recipe cards with that 4 x 6 journaling die. What a great idea. Oh my goodness, what a great idea!! I've been wanting to make a recipe book with matching cards:) Thank you so much for sharing! Making a collection of cards would be a huge undertaking! The new Get Schooled set is perfect for these cards. I don't like my handwriting and need to work on getting over that because the handwriting does make things more personal. Great job! Cute recipe card. I love the new school paper stamp set. Its perfect!!. Great idea Liz! Love the versatility of MCT products!!! What a sweet idea to pass along recipes this way, so personal and I totally agree that handwriting the recipe makes this gift even more special. I still have my recipe box and handwritten recipes from my bridal shower from many years ago and I treasure it even more now. 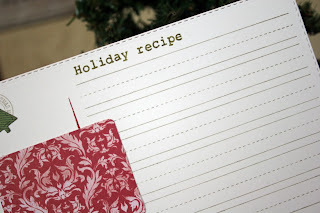 Liz ~ CUTE idea to make up Family recipes/traditions for gifts! Especially you have a daughter who is getting married! I LOVE it and your handwriting is so nice~ I have seen it before! Beautiful idea and project! What a super cute idea!! This is such a fabulous idea Miss Liz! I have been wanting to do a family cookbook to leave "behind" and will have to use this wonderful idea for the recipe cards! Love it! This is really nice for a handwritten recipe, I think. So personal and pretty too. And I like how you showed the die in this way for sizing. Great inspiration. It is a very great idea, thanks for sharing. Clean and simple, gr8t job! Farewell Blog Hop ~ Trouble! 5 Days of Christmas ~ Day 4! 5 Days of Christmas ~ Day 3! 5 Days of Christmas ~ Day 2!